Generosity works. Not only does it make you feel good, but it’s also the key to unlocking business growth. This used to be hard to scale, but not anymore. You can now produce and propagate content to serve thousands of people at once. You can talk to them like it’s one-to-one. You can serve, at scale. When you serve, you earn the right to serve again. Over time, you earn enough trust to ask for the sale. You can’t ask too often and you can’t ask too much. But when it comes time to ask – your best customers will come through for you. 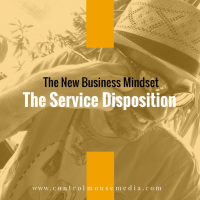 Episode 94 is about adopting what I call the “service disposition,” in every aspect of your business – a lesson that I learned from content marketing. Listen to the episode here or subscribe in iTunes. Content marketing is more effective when you serve by teaching: Producing Content to Educate Your Customers. It has to be done with a strategy, though: The Four Principles of Teaching Your Customers. And it can lead to the logical outcome of building an online course for customer acquisition or customer on-boarding. Here’s the episode where I asked your opinion about adding sponsorships to this podcast. Subscribe here (and select podcast / every new post) if you want to be notified as soon as new episodes are published! Published May 22, 2017 by Michael Boezi.